This best loaf pans available on the market are those made of long-lasting nonstick material. Moreover, the pans should be oven safe up to 500f. One of such loaf pans is the Rachel Ray Oven Lovin’ Nonstick Pan. Rachel Ray produces a wide range of baking appliances that will make your life easier in the kitchen. 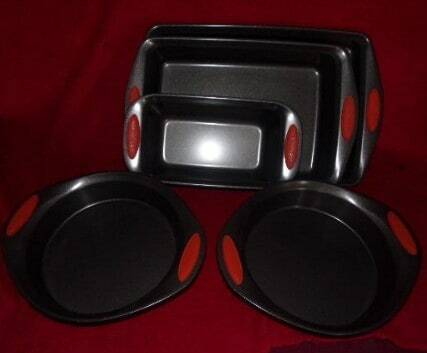 The bakeware set comprises of loaf pans, muffin pans, cookie sheets and more. Why is this one of the best loaf pans on the market? It has a perforated removable tray, which you can use to drain away fat to remain with healthier meals. Let’s have a brief look about this loaf pan. One unique thing about Rachel Ray pans is that all of them have thick silicone grip handles. The pans are made from heavy gauge steel that prevents them from bending or warping. The baking pan can withstand oven temperatures of up to 500F. 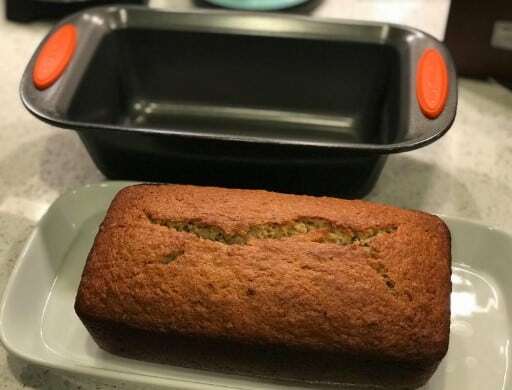 You can use the Oven Loving pan to make Rachel Ray banana bread or loaves for 2 to 4 people. Rachel Ray’s “Mile-High Lasagna” recipe is included in the 9 x 5 x 2.5 inches loaf pan. The 13 x 9 x 2.2 inches loaf pan is perfect for making desserts or preparing a simple dinner. Rachel Ray’s “Vegetable Ravioli Lasagna’ recipe is included in this pan package. Rachel Ray Yum O loaf pan has some impressive features. Nonstick surface – This results in easier preparation and cleaning. Wide handle – Expect a super comfortable grip. The perforated tray doesn’t have handles. It isn’t a good idea to wash it in the dishwasher. Getting the meatloaf out requires the careful and skillful use of the spatula. Generally, the Rachel Ray Yum O pans feel nice, slick and are not too thick or thin. The bread pans are aesthetically pleasing. However, the curl around the outer lip is not sealed and, therefore, the pan is prone to rust. It seems like the non-stick coating was applied after the lip cure. Moreover, after using the pans for years, the non-stick coating may start flaking off. Like all the Rachel Ray utensils, the muffin pan is made of heavy duty carbon steel and has a non-stick material. The pan is oven-safe up to 500 degrees Fahrenheit and has wide handles with silicone grips that make it easy to handle. 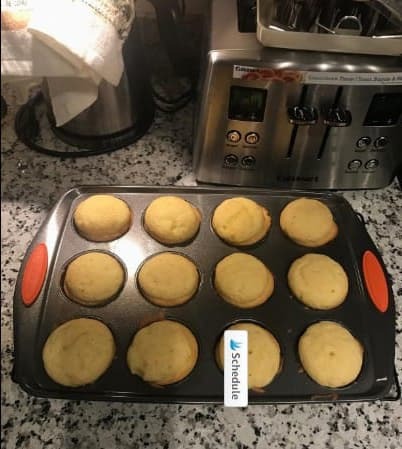 The pans have overgrown muffin-top edges that release the muffins without having to worry with spraying them down before filling. There is extra room on the edges of the pan to lift them out of the oven so that your hand/singer does not go into the batter. Silicon grips on the handle brighten up the pans. This pan has 12 muffin cups. A 24 cup version is also available. 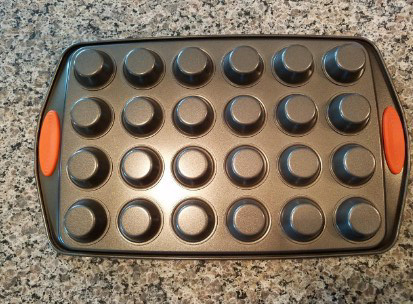 This muffin pan has all the characteristics and features found in the 12 cup muffin pan, except for the number of cups. Rachel Ray crispy cookie sheets are made from carbon steel that is durable and does not warp. The utensils are oven safe up to 500 degrees Fahrenheit and can be washed in a dishwasher. The cookie sheets have extra wide handles that make them easy to grab even when you are wearing bulky mitts. You can use the cookie sheets for different dessert or simple meals. For example, you can bake Rachael’s Roasted Baby Potatoes with Rosemary and oven fries to get great results. This baking sheet does a great job. However, we recommend that you use non-stick Reynolds wrap or parchment paper with them to avoid the non-stick material from getting chipped. 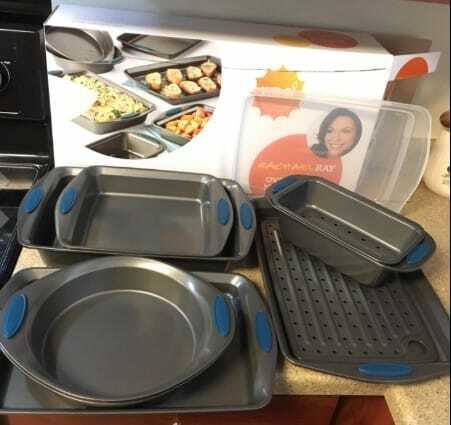 This Rachel Ray nonstick pan is sold together with exclusive Rachel Ray “Mexican Lasagna” recipe. The 9-inch round pan is great for making all types of cakes and its non-stick interior and exterior make cleaning easy. You do not need to spray the pan as your food will not stick. Cleaning the pan is just a matter of washing with mild soap or water. Keep in mind that this product is NOT dishwasher safe. The nonstick round cake pan has wide e handles that make it easy to hold. However, you will still need oven mitts when removing the pan from the oven. The handles are laced with silicone grips that color your kitchen. The pan can withstand temperatures of up to 500 degrees Fahrenheit and has truly nonstick qualities. 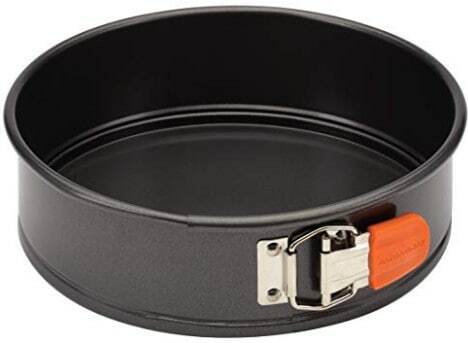 This product has the same construction and qualities as the round cake pan. The only difference is the shape of the pan. The Rachel Ray 3-piece bakeware set comprises of three Oven Lovin’ cookie pans, measuring 11 x 17 inches, 10 x 15 inches, and 9 x 13 inches. The pans are made from carbon steel, which is durable and does not warp. The pans are coated with a non-stick material and, therefore, food will not stick on them. Cleaning the pans is also easy. The Rachel Ray 3-piece Oven Lovin’ cookie pan set is ideal for making sweet and savory treats. The convenient sizes of the pans (small, medium and large) make them excellent for a wide variety of recipes, including yummy Rachel’s Kahlua Chocolate Chunk Cookies, Ranch-Style Potato Skins, broiling cheesy garlic bread, roasting stuffed eggplant and more. Rachel Ray cookie pans can withstand oven temperatures of up to 450 degrees Fahrenheit. These pans are easy to handle thanks to their wide grip handles. These durable pans are a must-have for creating delish baked foods. The cookie pans are also available in two colors: orange and blue. This Rachel Ray utensil set comprises of a 9 x 5 inches deep rectangle, 10 x 15 inches crispy sheet, 9 x 13 inches rectangle, and two 9-inch rounds. These items can withstand oven temperatures of up to 500F. The bakeware set is made from long-lasting material with non-stick properties. The non-stick feature makes the items easy to clean. Moreover, the bakeware set is dishwasher-safe. The bakeware pan set is perfect for making brownies, roasted potations, meatloaf, lasagna and cakes. You can use the 10 x 15 inches cookie pan for baking everyday desserts of preparing simple dinner. The pan comes with Rachel’s “Buffalo Chicken Meatballs” recipe. 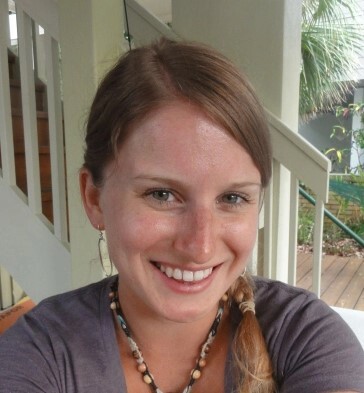 You can also experiment with other Rachel Ray’s recipes like the Espresso Brownies, Almond Joy Layer Cake, Four Cheese Baked Pasta and Eggplant Parmesan. All the bakeware items have extra wide handles that make it easier to grab them. The handles are laced with comfortable orange silicone grips to make it easy for you to remove them from the oven. The quality bakeware set comes in fun colors and will easily complement your other kitchen appliances. Keep in mind that the bakeware set is only to be used in an oven, not a microwave. It is also advisable to use parchment paper on top of them and use a plastic or rubber spatula to avoid damaging the coating. The Rachel Ray bakeware set is a little expensive than that of other brands out there. However, they are durable and you won’t be replacing them after three uses like is the case with others that come at half the price. This bake set is available in orange, red, and blue colors. The Rachel Ray 10 piece bakeware set is made from heavy-duty steel, which is durable and does not warp. The steel is coated with a non-stick surface that makes it release food excellently. Like other Rachel Ray utensils, this set comes in bold colors of orange and blue and have wide handles for a great grip. The bakeware set can take temperatures of up to 500 degrees Fahrenheit. 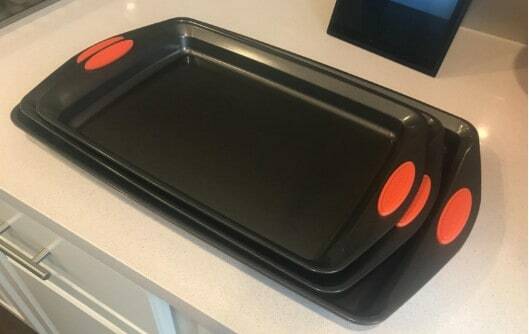 The utensils available in this bakeware set include: 9 x 13 inch crispy sheet pan, 9-inch square cake pan, 9 x 13 inches covered cake pan, two 9-inch round cake pans, two-piece 9 x 5 inches meatloaf pan with insert, two-piece 10 x 15 inches sheet pan with insert, and a 9 x 13 inches covered cake pan. The pans are light, a little thick and also rigid. Therefore, you can be sure they will not warp. The silicone grips are appealing and the granular texture provides for great handling. Included in the set is a plastic cover that can be used for the two 9 x 13 inches pan. However, it is much difficult to remove from the shallow one. Another plus of the bakeware set is that the inserts available for the large sheet pan and the meatloaf pan. All the baking appliances come with specific recipes to give you a head start. Made of anodized steel and coated with a non-stick surface, these appliances will make your baking easier. 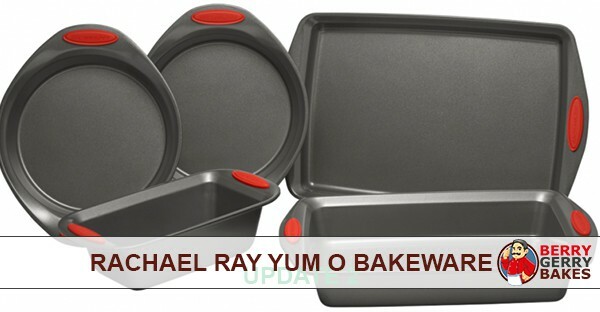 You can shop Rachel Ray Yum O Bakeware on Amazon.